California is a community property state. This means that when a couple seeks a divorce, their marital assets (and debts) will be divided evenly between them. In order to determine what is marital property – subject to distribution – the parties and the court must identify and characterize the nature of each asset and debt. This phase of the proceedings can have a profound impact on the financial standing of each of the parties after the divorce. A family law attorney with experience handling divorce cases in the San Diego area would be able to protect one’s rights to property in accordance with local court rules and procedures. Because California is a no-fault divorce state, courts typically do not look to the behavior of one spouse or the other when dividing up the couple’s assets. But a recent New York divorce case making headlines throughout the country illustrates one court’s effort to hold a wife accountable for her poor conduct throughout the proceedings. Here, the couple separated in 2007 after 19 years of marriage. They had two children, one of whom has significant hearing loss. The husband is a partner in a large law firm in New York. His interest in the partnership was one of the marital assets to be distributed in the divorce. Throughout the proceedings, the wife publicly complained about her husband, at one point stating that he was too cheap to pay for his daughter’s hearing aids. Some of the negative comments appeared in newspapers and Internet postings. When it came time to apportion each party’s rights to the husband’s partnership interests, the court chose to grant the husband 83% and the wife 17% of the business’ value. In making this determination, the judge pointed out that the wife’s periodic public complaints about the husband (in conjunction with the bad economy) served to reduce the value of the business assets. Specifically, the judge noted that any negative publicity, during a time when the work in the husband’s field was in decline, could potentially scare away clients. Essentially, the court found that the wife’s poor behavior during the divorce proceedings contributed to the husband’s ability to attract and maintain clients, thereby reducing the value of the partnership. While this case took place in New York, and the opinion does not govern family law proceedings in California, there is no question that courts throughout the country have taken note of the judge’s ruling. Courts in California, however, typically divide marital property evenly in divorce. The important part of this aspect of the proceedings is to carefully identify and classify each asset – so that division is just and fair. Marital property may include any number of items, some more obvious than others, such as any homes, furniture, cars, bank accounts (and cash), stocks, pension and 401(k) plans, life insurance that has cash value, a business and other items. Divorce can be a taxing experience, both emotionally and financially. Parties are encouraged to reach out to an experienced family law attorney to help protect one’s financial interests and to help move the process along smoothly and efficiently. 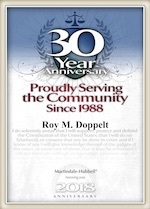 Roy M. Doppelt has been representing parties with divorce matters for more than 20 years. Doppelt and Forney, APLC serves clients throughout Southern California, including San Diego, Encinitas, La Jolla, and Chula Vista. For a free consultation, contact Doppelt and Forney, APLC through our website, or give us a call toll-free at (800) ROY IS IT (769-4748).